McGill University is a public university located in Montreal, Quebec, Canada. Founded in 1821, McGill is one of the oldest universities in Canada. The university bears the name of Scotsman James McGill, a prominent merchant in Montreal, whose bequest formed the beginning of the university. Its primary language of instruction is English despite the large population of French speakers in Montreal. McGill strives to advances learning through excellence in research and teaching, and to serve society as a whole. The University has been recognized for its award-winning research, particularly in the health sciences, and participates in research organizations both within Canada and internationally. McGill has 13 faculties and professional schools, offering degrees and diplomas in over 300 fields of study, including medicine. McGill has featured significantly in the development of several sports, including American football the first game of which was played between McGill and Harvard in 1874, and ice hockey. McGill University's Mission is "the advancement of learning through teaching, scholarship and service to society." The university strives to achieve these goals by providing excellent education, staying competitive in its research and academic programs, and by giving back to society in the form of appropriate service. McGill is highly ranked among Canada's universities, particularly among those offering medical and doctoral degrees. From 2003-2004, the University was ranked number one in Canada by the Maclean's University Rankings report. In The Times Higher Education Supplement university rankings for 2008, McGill University was ranked the best university in Canada, the second-best public university and 14th overall in North America, and 20th in the world. In Shanghai Jiao Tong University's Academic Ranking of World Universities 2008, McGill ranked third in Canada, 42nd in the Americas, and 60th in the world. McGill is also often recognized for its research programs. Research Infosource named McGill "Research University of the Year" in its 2003 and 2005 rankings of Canada's Top 50 Research Universities. In 2007, Research Infosource ranked McGill the second-best research university in the country, after the University of Toronto. They also ranked McGill University third in Canada in research-intensity and fourth in total-research funding, finding that McGill ranks in the top five universities in terms of research dollars and number of refereed publications per full-time faculty member. McGill is perhaps best recognized for its research and discoveries in the health sciences. William Osler, Wilder Penfield, Donald Hebb, Brenda Milner, and others made significant discoveries in medicine, neuroscience, and psychology while working at McGill. The first hormone governing the Immune System (later christened the Cyrokine 'Interleukin-2') was discovered at McGill in 1965 by Gordon McLean. The invention of the world's first artificial cell was made by Thomas Chang, an undergraduate student at the university. While chair of physics at McGill, nuclear physicist Ernest Rutherford performed the experiment that led to the discovery of the alpha particle and its function in radioactive decay, which won him the Nobel Prize in Chemistry in 1908. Statue of James McGill, in the Winter, on McGill University downtown campus. 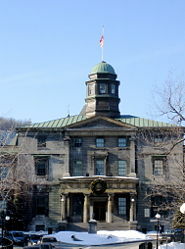 McGill University was founded through the philanthopic act of James McGill. Born in Glasgow, Scotland and educated at Glasgow University, he became one of the Montreal merchants involved in the fur trade south of the Great Lakes from 1770. Rumored to be the richest man in Montreal, he left his 19 hectares (47 acres) estate and £10,000 to the Royal Institution for the Advancement of Learning (RIAL) to found McGill University. Until that time, RIAL had focused primarily on administering elementary schools in Quebec, but pursuant to the terms of McGill's will, the estate left to the Institution was applied to the creation of a university. On March 31, 1821 McGill College received a Royal Charter from King George IV. The Charter provided that the College should be deemed a University, with the power of conferring degrees. In 1829 McGill College was officially inaugurated and classes began. The Montreal Medical Institution became the college's Faculty of Medicine, McGill's first academic unit. The Faculty of Medicine granted its first degree, a Doctor of Medicine and Surgery, in 1833. The Faculty of Medicine remained the school's only functioning faculty until 1843 when the Faculty of Arts commenced teaching in the newly constructed Arts Building and East Wing (Dawson Hall). Sir John William Dawson, McGill's principal from 1855 to 1893, has been credited with transforming the school into a modern university. He recruited the aid of Montreal's wealthiest citizens, many of whom donated property and funding needed to construct the campus buildings. This expansion of the campus continued until 1920. Women's education at McGill began in 1884, when Donald Smith, also known as Lord Strathcona, began funding separate lectures for women, given by university staff members. The first degrees granted to women at McGill were conferred in 1888. In 1899, the Royal Victoria College (RVC) opened as a residential college for women at McGill. Until the 1970s, all female undergraduate students, known as "Donaldas," were considered to be members of RVC. In 1905, the university acquired a second campus when Sir William C. Macdonald, one of the university's major benefactors, endowed a college in Sainte-Anne-de-Bellevue, 32 kilometers (20 mi) west of Montreal. Macdonald College, now known as the Macdonald Campus, opened to students in 1907, originally offering programs in agriculture, household science, and teaching. McGill established the first post-secondary institutions in British Columbia to provide degree programs to the growing cities of Vancouver and Victoria. It created Victoria College in 1903, a two-year college offering first and second-year McGill courses in arts and science, which was the predecessor institution to the modern University of Victoria. The province's first university was incorporated in Vancouver in 1908 as the McGill University College of British Columbia. The private institution granted McGill degrees until it became the independent University of British Columbia in 1915. The main gates, called Roddick Gates, of McGill University, Montreal. The large square building in the back, right, is Burnside Hall. The 1960s represented an era of large nationalist and labor mobilizations in Quebec, and McGill University became the site of political unrest and controversy. Since its founding, classes at McGill had been taught primarily in English, despite the city of Montreal's large population of French speakers. The McGill français movement began in 1969, clamoring for a new McGill that would be francophone (French speaking), pro-nationalist, and pro-worker. It was argued that, since McGill government funding, paid by a taxpayer base that was largely francophone, the university should equally be accessible to that segment of the population. Stanley Gray, a political science professor from Ontario, led a demonstration at the university's Roddick Gates on March 28, 1969. Protesters shouted "McGill français," "McGill aux Québécois," and "McGill aux travailleurs" (McGill for workers). However, the majority of students and faculty opposed such a position, and many of the protesters were arrested. Francophones currently make up approximately 18 percent of the student body, a goal set by the administration in the wake of the movement. Today, McGill is one of only three English-language universities in Quebec; fluency in French is not a requirement to attend. The Faculty of Law does, however, require all students to be "passively bilingual," meaning that all students must be able to read and understand spoken French—or English if the student is Francophone—since English or French may be used at any time in a course. McGill's main campus is located in downtown Montreal, near the Peel and McGill metro stations. Most of its buildings are situated in a park-like campus located north of Sherbrooke Street and south of Pine Ave between Peel and Aylmer streets. All of the major university buildings were constructed using local grey limestone, which serves as a unifying element. 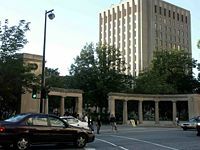 McGill's residence system is relatively small for a school of its size, housing approximately 2,400 undergraduate students and a handful of graduate students. Royal Victoria College, the second-largest residence at McGill, is a women's only dormitory. McGill's newest and largest residence, aptly named New Residence Hall ("New Rez"), is a converted four-star hotel located a few blocks east of campus. McGill Off-Campus Residence Experience (MORE) residences consist of a series of converted apartment buildings and houses, the largest of which is The Greenbriar, an apartment-style residence located across from the Milton Gates. The downtown McGill campus sport and exercise facilities include the McGill Sports Centre (which includes the Tomilson Fieldhouse and the Windsor Varsity Clinic), Molson Stadium, Memorial Pool, Tomlinson Hall, McConnell Arena, Forbes Field, many outdoor tennis courts and other extra-curricular arenas and faculties. The Macdonald Campus facilities, include an arena, a gymnasium, a pool, tennis courts, fitness centres and hundreds of acres of green space for regular use. The university's largest sporting venue, Molson Stadium, was constructed in 1914. It seats over 20,000 people and is the home field of the Montreal Alouettes. McGill has a large library with over ten different branches and numerous special collections, containing more than 6 million volumes. Aside from the Main Library building, there is the Blackader-Lauterman Library of Architecture and Art, the Education Library and Curriculum Resources Centre, the Mathematics and Statistics Library, the Howard Ross Library of Management, the Humanities and Social Sciences Library, the Islamic Studies Library, the Life Sciences Library, the Macdonald Campus Library, the Marvin Duchow Music Library, the Nahum Gelber Law Library, and the Schulich Library of Science and Engineering. Some of the special collections include the Blacker-Wood Collection, the Government Information Service, and Walter Hitschfeld Geographic Information Centre. The university also has several museums on campus, including the The Lyman Entomological Museum which houses a vast insect collection and the Redpath Museum which houses collections from the disciplines of paleontology, zoology, mineralogy, and ethnology. McGill's Gault Nature Reserve spans over 10 square kilometers (3.9 sq mi) of forest land, the largest remaining remnant of the primeval forests of the St. Lawrence River Valley, on Mont St. Hilaire. The Morgan Arboretum, a 245 hectares (610 acres) forested reserve is located at the university's Macdonald campus. In addition, the university has several institutes and centers, including: All links retrieved February 27, 2009. McGill offers over 340 academic programs in eleven faculties and over 250 doctoral and master's graduate degree programs. The University's undergraduate programs include Agricultural Sciences, Architecture and Infrastructure Engineering, Earth System & Physical Sciences, Education, Health Sciences, Medicine, Dentistry, Law, Religious Studies and Social Work. McGill's graduate level programs include Anthropology, Animal Science, Bioresource Engineering, E-Business,Experimental medicine, Information Technology, Management, Mining and Materials Engineering and Urban Planning. The university also offers advanced degrees in the fields of Law, Dentistry and Medicine. McGill has extensive research programs as well as academics. According to the Association of Universities and Colleges of Canada, "Researchers at McGill are affiliated with about 75 major research centers and networks, and are engaged in an extensive array of research partnerships with other universities, government and industry in Quebec and Canada, throughout North America and in dozens of other countries." In the 2007-2008 academic year, $375,75.00 million Canadian dollars were allocated to research, with 147 international research and development partnerships, 180 contracts with industries and around 100 inventions were announced. McGill Campus, looking down from Mount Royal. McGill's students represent a diverse geographic and linguistic background. International students hail from over 150 different countries, the majority coming from the United States. 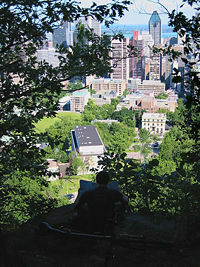 The growing number of American students attending McGill are attracted to the culture and dynamism of Montreal, the university's reputation, and the relatively low tuition in comparison to many top public and private universities in the United States. 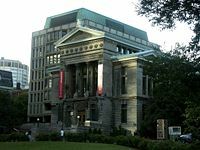 The campus has an active students' union represented by the undergraduate Students' Society of McGill University (SSMU) and the Post-Graduate Students' Society of McGill University (PGSS). In addition, each faculty has its own student governing body. There are hundreds of clubs and student organizations at the university, many of them centered around McGill's student union building, the University Centre. McGill has two English-language student-run newspapers: the McGill Daily, which is a financially independent publication, and the McGill Tribune, which is published through SSMU. The McGill Daily, first published in 1911 and currently published twice weekly, is the oldest daily student paper in Canada. The Délit français is the Daily's French-language counterpart.McGill Foreign Affairs Review is a student-run journal about international affairs, and The Red Herring is McGill's the satire magazine. CKUT (90.3 FM) is the campus radio station. TV McGill is the University TV station, broadcasting on closed-circuit television and over the internet. While fraternities and sororities are not a large part of student life at McGill, some, including fraternities Alpha Epsilon Pi, Delta Upsilon, Sigma Alpha Mu, and Zeta Psi, and sororities Gamma Phi Beta and Alpha Omicron Pi, have been established there for many years. Phi Kappa Pi, Canada's only national fraternity, was founded at McGill and the University of Toronto in 1913 and continues to be active to this day. Events including Greek week, held annually during the first week of February, have been established to promote Greek life on campus. With just over two percent of the student body population participating, involvement is well below that of most American universities, but on a par with most Canadian schools. McGill and its alumni have featured significantly in the development of several North American sports. Playing hockey on the skating rink, McGill University, 1884. In 1865, the first recorded game of rugby in North America occurred in Montreal, between British army officers and McGill students. The first game of what would become American football was played between McGill and Harvard on May 14, 1874. In this game, rules adapted from rugby were used, which Harvard then spread throughout the Ivy League, giving rise to American football. The foundation of the modern game of ice hockey centered on Montreal, Quebec. 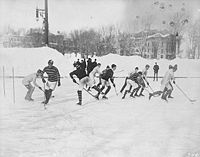 On March 3, 1875 the first organized indoor game was played at Montreal's Victoria Rink by James Creighton and several McGill University students. In 1877, several McGill students codified seven ice hockey rules, and formed the first ice hockey club, McGill University Hockey Club. McGill alumnus James Naismith invented basketball in 1891. Today, McGill is represented in Canadian Interuniversity Sport (CIS) by the McGill Redmen (men's) and the McGill Martlets (women's). The school has over 50 varsity sports teams, ranging from Basketball, Football, Track and Field, Hockey, Figure skating, Lacrosse, and Rowing. The university also has several intramural sports including Ball Hockey, Soccer, Volleyball, and Badminton. The Sports Center on the main campus also offers health and exercise courses, as well as provides facilities for students to purpose exercise and related physical activities. McGill has a long tradition of rivalry with the Queen's University in Kingston, Ontario. Animosity between rowing athletes at the two schools has inspired an annual boat race between the two universities in the spring of each year since 1997. The rivalry, which was once very intense, waned after Queen's pulled their football team out of the Ontario-Quebec Intercollegiate Football Conference in 2000; however, it returned in 2002 when it transferred to the annual home-and-home varsity hockey games between the two institutions, yet the McGill's/Queen's challenge also survives in the form of the annual boat race between the two schools. There are several established traditions at McGill University, one of which is the collecting of songs created by alumni for their alma mater. In British tradition, the University has its own coat of arms, which was officially created by England's Garter-King-at-Arms in 1922 and later was registered with the Public Register of Arms, Flags and Badges of Canada. The university's symbol, the martlet, is present on the coat of arms, as well as the school's official colors of red and white, and the official motto, Grandescunt Aucta Labore, Latin for: "By hard work, all things increase and grow." In heraldic terms it is defined as "Argent three Martlets Gules, on a chief dancette of the second, an open book proper garnished or bearing the legend In Domino Confido in letters Sable between two crowns of the first. Motto: Grandescunt Aucta Labore." Antony Alcock—involved in the negotiations leading up to the Belfast Agreement signed in Belfast on April 10, 1998 (Good Friday) by the British and Irish governments and endorsed by most Northern Ireland political parties, ending The Troubles. Gerald Bull—former professor of mechanical engineering, expert on projectiles, designer of the Iraqi Project Babylon. Thomas Chang—developer of the world's first artificial cell. Ismail al-Faruqi—renowned Muslim philosopher and comparative religion scholar. Val Logsdon Fitch—Nobel Prize winning Physicist. S. I. Hayakawa—linguist, U.S. senator, former president of San Francisco State University. Jennifer Heil—2006 Olympicgold medalist in freestyle skiing. David Hunter Hubel—Nobel Prize winner in Physiology. Mohan Munasinghe—winner of the 2007 Nobel Peace Prize. James A. Naismith—inventor of the game of basketball. Justin Trudeau—son of former Prime Minister Pierre Trudeau. ↑ 1.0 1.1 McGill University, "McGill University Mission Statement." Retrieved February 15, 2009. ↑ McGill University "McGill again tops Maclean's University Rankings" Retrieved February 15, 2009. ↑ QS Quacquarelli Symonds Limited, "McGill University" QS Intelligence Unit, 2008. Retrieved February 15, 2009. ↑ Academic Ranking of World Universities, "Top 500 World Universities (1-100)" Institute of Higher Education, Shanghai Jiao Tong University, 2008. Retrieved February 15, 2009. ↑ Christine Zeindler, "McGill is research university of the year, tops in Times," McGill Reporter, October 27, 2005. Retrieved February 20, 2009. ↑ 6.0 6.1 Research Infosource,Research Universities of the Year 2007 Research Infosource, 2007. Retrieved February 20, 2009. ↑ Gordon J. Maclean. "A Lymphocyte-stimulating Factor produced in vitro." Nature 208 (1965): 795–796. ↑ T. M. Chang and M. J. Poznansky, Journal of biomedical materials research 2(2) (1968): 187-199. ↑ McGill University "Foundation History" Retrieved February 16, 2009. ↑ McGill University "The Gallery: 1821 Charter" Retrieved February 16, 2009. ↑ David S. Crawford, "Montreal, Medicine and William Leslie Logie: McGill's first graduate and Canada's first medical graduate. 175th. anniversary," Osler Library Newsletter 109 (2008): 1-7. Retrieved February 20, 2009. ↑ McGill University, "History" Retrieved February 16, 2009. ↑ 14.0 14.1 McGill University "Royal Victoria College," McGill History, 2004. Retrieved February 16, 2009. ↑ UBC Archives, "Higher Education in British Columbia Before the Establishment of UBC" Retrieved February 16, 2009. ↑ 17.0 17.1 Brownwyn Chester, "McGill français and Quebec society," The McGill Reporter, April 8, 1999. Retrieved February 20, 2009. ↑ Eric Smith, "A reunion of radicals," Daily, September 26, 1996. Retrieved February 20, 2009. ↑ McGill University "McGill Quick facts" Retrieved February 16, 2009. ↑ Studyplaces.com, "McGill University" Retrieved February 16, 2009. ↑ McGill University, "Welcome to McGill University Residences & Student Housing!" Student Information: Residences, 2009. Retrieved February 20, 2009. ↑ 22.0 22.1 22.2 22.3 22.4 22.5 Robin Erskine-Levinson, McGill University Qb 2007 (College Prowler, 2006, ISBN 1427400946). ↑ McGill University "Welcome to Macdonald Campus Athletics" Retrieved February 17, 2009. ↑ McGill University "Molson Stadium" Retrieved February 17, 2009. ↑ McGill University "About the Library" Retrieved February 16, 2009. ↑ Blackader-Lauterman Library of Architecture and Art, Retrieved February 27, 2009. ↑ Education Library and Curriculum Resources Centre, Retrieved February 27, 2009. ↑ Edward Rosenthall Mathematics and Statistics Library, Retrieved February 27, 2009. ↑ Humanities and Social Sciences Library, Retrieved February 27, 2009. ↑ Islamic Studies Library, Retrieved February 27, 2009. ↑ Life Sciences Library, Retrieved February 27, 2009. ↑ Macdonald Campus Library, Retrieved February 27, 2009. ↑ Marvin Duchow Music Library, Retrieved February 27, 2009. ↑ Nahum Gelber Law Library, Retrieved February 27, 2009. ↑ Schulich Library of Science and Engineering, Retrieved February 27, 2009. ↑ Blacker-Wood Collection, Blacker-Wood Collection. Retrieved February 27, 2009. ↑ Government Information Service, Retrieved February 27, 2009. ↑ Walter Hitschfeld Geographic Information Centre, Retrieved February 27, 2009. ↑ The Lyman Entomological Museum, Retrieved February 27, 2009. ↑ Redpath Museum, Retrieved February 27, 2009. ↑ McGill University "The Gault Nature Reserve" Retrieved February 16, 2009. ↑ McGill University, "What Can I study at McGill?" Retrieved February 17, 2009. ↑ Association of Universities and Colleges of Canada, "McGill University." Retrieved February 17, 2009. ↑ McGill University, "Research." Retrieved February 17, 2009. ↑ 46.0 46.1 Nancy Vix and Gregg Vix, Guide to College in Canada for American Students (Avocus Publishing, 2006, ISBN 1890765120). ↑ Parker Williams, "Greek Row: Fraternity participation up, sororities down," The Daily Utah Chronicle, July 19, 2008. Retrieved February 20, 2009. ↑ RugbyFootballHistory.com, "Historical Rugby Milestones 1860s." Retrieved February 20, 2009. ↑ Robert E. Watkins, "A History of Canadian University Football," Canadian Interuniversity Sport, 2004. Retrieved February 19, 2009. ↑ Robert E. Watkins, "A History of Canadian University Football", Canadian Interuniversity Sport Football, 2006. Retrieved February 19, 2009. ↑ "History of American Football,", NEWSdial.com, 2008. Retrieved February 19, 2009. ↑ Earl Zukerman, "McGill’s contribution to the origins of ice hockey," McGill Athletics, March 17, 2006. Retrieved February 19, 2009. ↑ "Dr. James Naismith," Naismith Museum and Hall of Fame.Retrieved February 19, 2009. ↑ McGill University, "McGill Songs" Retrieved February 18, 2009. 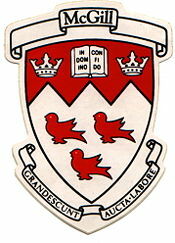 ↑ McGill University, "Mission, Motto and Coat of Arms" Retrieved February 19, 2009. Axelrod, Paul. "McGill University on the Landscape of Canadian Higher Education: Historical Reflections." Higher Education Perspectives 1 (1996-1997). Coleman, Brian. "McGill, British Columbia." McGill Journal of Education 6(2) (Autumn 1976). Frost, Stanley B. The History of McGill in Relation to the Social, Economic and Cultural Aspects of Montreal and Quebec. Montreal: McGill University, 1979. Markell, H. Keith The Faculty of Religious Studies, McGill University, 1948-1978. Montreal: Faculty of Religious Studies, 1979. McNally, Peter F. McGill University: For the Advancement of Learning (1970-2002) Vol III. Montreal: McGill-Queen’s University Press, not yet published. This page was last modified on 11 September 2018, at 16:30.